A standardized signaling protocol (RFC 3261) which works over TCP (typically on port 5060) at the application OSI layer. Its role is to create, modify or terminate phone sessions. SIP behaves very similarily to HTTP in that SIP clients send requests to the server which will answer with responses (status). 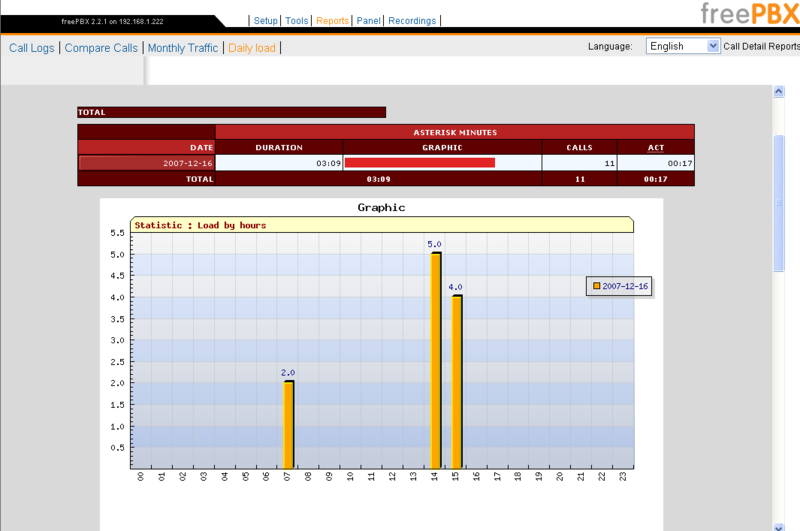 The difference with HTTP is that SIP clients can also respond to requests made by a server. Other signaling protocols are H.323 or the Cisco protocol SCCP. SIP is progressively replacing these two protocols. A standardized protocol (RFC 4566) providing information about multimedia initialization settings such as VoIP calls. A standardized transport protocol (RFC 3550) working over UDP at the transport OSI layer. A protocol closely linked with RTP (also defined in RFC 3550). It does not transport any data but gives information about the quality of the service provided by RTP. Here is a Wireshark capture of the SIP registration process. Babar registrates with the trixbox server. The client tries to register with the server. 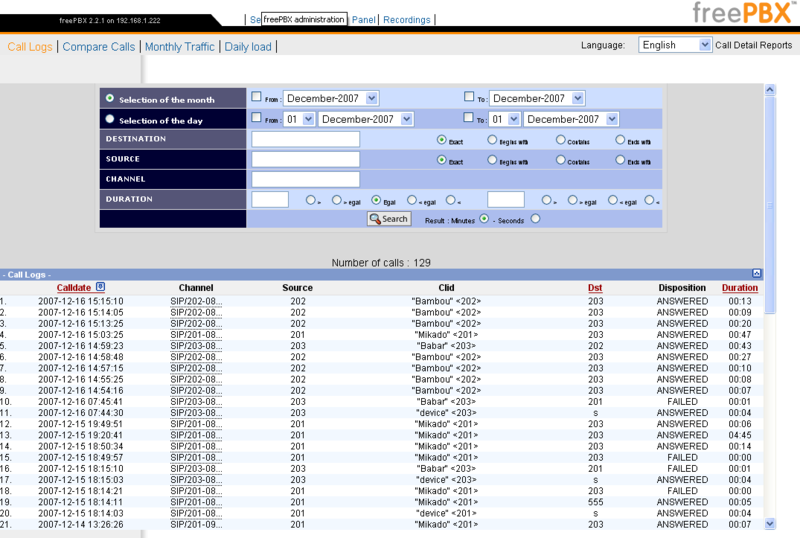 The server indicates to the client that it is performing searches. The server rejects the client registration and sends it back a challenge digest composed of an algorithm type, a "realm" and a "nonce". The "nonce" is a random value created on the Asterisk server and sent to the client. It has a limited lifetime which prevents replay attacks. Each challenge digest contains a different nonce value. The "realm" is the SIP domain name. Digest authentication checks that both communicate parties know a shared password. WWW-Authenticate: Digest algorithm=MD5, realm="asterisk", nonce="29b8191d"
"username", "realm", "nonce", "uri", "response" and the algorithm. The "URI" (Uniform Resource Identifier) is a string of characters used to identify a resource. The "nonce" sent by the server is used to compute a "response". The server warns the client that it is performing searches. After computation, the server is able, to validate the client password thanks to the digest response it just received. With the digest authentication process, no password is exchanged between the client and the server. The server can send a message to the client to validate the registration. Here is a Wireshark capture of the SIP initialization and closure processes. Bambou (extension 202) calls Babar (extension 203), talks to it and then hangs up (closure/termination). Let us see in detail the steps needed for SIP to establish a VoIP call before voice data can be exchanged between two parties. The client indicates to the server that it wants to establish a phone call. The server rejects the client invitation and sends back a challenge digest composed of an algorithm type, a "realm" and a "nonce". Digest authentication checks that both communicating parties know a shared password. Proxy-Authenticate: Digest algorithm=MD5, realm="asterisk", nonce="138dd154"
After computation, the server will be able, to validate the client password with the digest response it just received. The server invites the recipient (Babar - 203). The server sends a message to the sender (Bambou - 202) in order to ring its phone. The recipient (Babar - 203) tells the server that its phone is ringing. The recipient (Babar - 203) confirms the server invitation. The server acknowledges the recipient (Babar - 203) confirmation. The server confirms the sender (Bambou - 202) invitation (step 4). The sender (Bambou - 202) acknowledges the server confirmation. The phone call can begin. The RTP protocol will transport the VoIP packets and the RTCP will control the link quality. The sender (Bambou - 202) hangs up. The server confirms the sender's (Bambou - 202) BYE message with an OK. The server tells the recipient (Babar - 203) that the sender (Bambou - 202) hanged up. The recipient (Babar - 203) confirms the BYE message with an OK.
SDP is closely related to SIP. 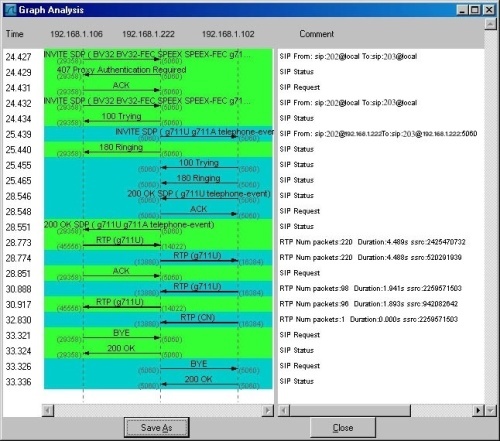 The Wireshark capture is the same one used to illustrate the SIP initialization and closure processes. Below, the SIP message header of the first capture line (INVITE) containing SDP infomation (in bold). The RTP protocol is used to transport the voice data and thus enable to two people to speak together. RTCP is used in conjunction with RTP to check the communication quality. Extended statistics can be obtained in the "reports" sections of the FreePBX interface.